Is it time to boycott SAGE? It sounds like a satire on capitalism but reality is often even worse. 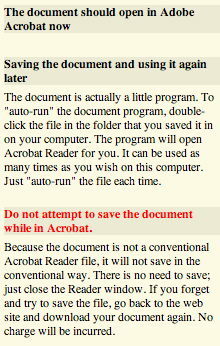 If you have written an article for SAGE you cannot send your own article to colleagues, you cannot copy nor save it. You can read it on one computer only according to anthropologist and Culture Matters blogger Lisa Wynn. Dear Contributor, Thank you for submitting your article titled “Shape Shifting Lizard People, Israelite Slaves, and Other Theories of Pyramid Building: Notes on Labor, Nationalism, and Archaeology in Egypt” to Journal of Social Archaeology, which was recently published in volume 8 issue 2 of the journal. “I will NEVER again consider publishing with them as long as Sage is running things this way", she comments. I have followed the download-link and made these two screenshots. PS: Strangely enough, as a SAGE-subscriber via my university account, I could download a conventional pdf-file of her article. Christopher Kelty wrote about similar difficulties to get a free copy of his own article, published in the journal Cultural Anthropology in his Savage Minds-post Recursive public irony. Yes, according to what Sage sent me, if your university subscribes, you can download a conventional PDF (and then spread it around as much as you like). But if you don’t belong to a subscribing university, then you can only get this executable file (and only 25 people, too). The irony is that even if an AUTHOR doesn’t have a subscription, then the author doesn’t get the normal PDF, just the executable protected PDF. Maddening! Yeah, I got one of these, too, recently from another journal, but I cheated on the whole thing: I printed off a copy and then scanned it as a .pdf on our departmental copier. It’s a bit bigger than a normal .pdf, so it’s harder to circulate, but it does give me a way to send the article to overseas colleagues. This really is worthy of a boycott, just for being so ridiculous and for the aggressive way it tries to expropriate the intellectual property of the author. We need to keep in mind that we are the ones who sustain this system every day of our working lives, legitimating it, crediting it, feeding it. My belief is that were it not for the far too conservative and retrograde, traditionalist biases of old heads on tenure and promotion committees, most scholars would have abandoned locked down and print publications long ago. That this continues is really as distressing as it is unfair and irrational. I thought this might be also interesting to be discussed! “Free Access to SAGE Cultural Studies journals! “Register below for free online access to these titles. Once registered, you can browse abstracts, perform quick or advanced keyword searches, and download full-text articles until September 30th, 2008″.